I make a few confessions. I admire Steve Jobs, but I don't like him because in some ways, he's made my life quite difficult. I have a dislike for technology: I still write in cursive and whenever I write an e-mail I leave a few spaces where my signature would be. I'm not a Luddite in that I wish things were as they were. I recognize things have to change. Still, I resisted getting an iPod for the longest time. Jobs, the new biopic on the Apple founder, is neither a hagiography or a critical look at the maverick icon. Therein lies one of its many problems: it really says nothing about Steve Jobs, what made him tick, what made him so maddening and ingenious or what kind of person he was outside Apple HQ. Jobs doesn't have an identity problem; it just has no identity. We start in 2001 when Steve Jobs (Ashton Kutcher) introduces to his worshippers the iPod. From there, we jump thirty years into the past, where this shoe-averse kid is walking through Reed College. His days are spent taking hits of acid and screwing Chris-Ann Brennan (Ahna O'Reilly), who is not his girlfriend. Somewhere in his college days and metaphysical trips to India, he comes up with ideas that will change the world, something involving electronics. To work on these ideas, Steve turns to Steve Wozniak (Josh Gad), who he has known in the past. Woz is a genius who enjoys tinkering with computers but doesn't see this as something revolutionary. Steve does see the potential, but in order to prepare for this he needs not just the amiable Woz but a crew of others who help Jobs found Apple Computers. Now we hit certain matters in Jobs' life: Lisa, the illegitimate daughter he steadfastly refuses to recognize or even acknowledge her existence, the rise of Apple Computers and the people he pushed out (like the original Apple crew who were there at the beginning but whom he didn't see a need to give founders stock to), his long-term association with initial financier Mike Markkula (Dermot Mulroney), his development of both the LISA and Macintosh computers, Jobs pushing for Pepsi-Cola CEO John Scully to come to Apple and then Scully and the board pushing Jobs out, and Jobs' return to Apple at the board's behest to save the company. 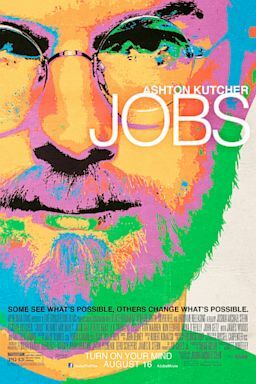 Jobs' ambition is to be Citizen Jobs, an honest portrayal of the Apple genius. It certainly doesn't shy away from making Steve Jobs an extremely unpleasant figure. He fires people on the spot for not seeing 'the big picture', dismisses those who have truly helped him (but who also seem loyal to him for reasons that one cannot fathom) save for Wozniak, who is unaware that he was screwed over in the beginning by his friend, and in what could have been a strong scene rejects his baby mama much to her intense heartbreak. However, in this scene we see where a lot of Jobs goes wrong. This is suppose to be an intense, dramatic scene, one filled with sadness. Instead, at the screening I attended, this scene elicited laughter. Here we have a perfect moment that drips with great dramatic potential: the illegitimate child (Jobs was adopted and refused to have anything to do with his birth father) himself rejects his illegitimate child, the past repeating itself. However, in the hands of director Joshua Michael Stern, screenwriter Matt Whiteley, and star Ashton Kutcher it not only falls flat but it makes people break out into chuckles. The fault lies in the screenplay. There are two things wrong with Jobs' script. The first is that we never know who any of these people are, in particular Steve Jobs (the subject of Jobs, and there is something wrong in a biopic when the central character remains opaque throughout). People float in and out and we're almost expect to know who they are (maybe if we'd had a program to tell one evil Apple Board member from another...). What happened to Daniel Kottke (Lukas Haas) who started dropping acid with Steve and is eventually screwed over by his former friend? Why do Bill Hernandez (Victor Rasuk) and Chris Espinosa (Eddie Hassell) stay loyal to Jobs when he has never reciprocated? Furthermore, just WHO are these people? We never get to know them as people (in many ways, we see them like Jobs saw them: people only as good/important as they are useful to him), let alone what drives them. In particular, this is true for the central character. WHY did he go to India? Did he get anything out of this journey of mysticism? Furthermore, the film itself never explains other matters, in particular in regards to Lisa Brennan/Jobs. For most of Jobs he goes out of his way to have nothing to do with her, then in 1996 we suddenly see Lisa in the Jobs' home, where he now has a wife and son. HOW did this reunion happen? WHEN did this reunion happen? WHY did this reunion happen? Did Mrs. Jobs have a hand in it? None of that is answered, and one cannot introduce story elements without bothering to answer them. Everyone in Jobs, especially Steve Jobs, remains out of reach, unknown. Whatever or whoever even the smallest character is (such as Mr. and Mrs. Jobs) remain a shadow. Given that not many people know who Mike Scully is, why should we care who he is or what he did to Steve? The second element that sinks Jobs is the performances within it. Much has been made of the casting of Ashton Kutcher in the title role. I understand he is actually a bright person (he did study to be a heart surgeon), but he also has a reputation of being an imbecile (he gave up medicine to be an underwear model, and his roles as the dim-witted Kelso in That 70's Show and Dude, Where's My Car? along with his marriage to Demi Moore do not help his reputation of being a himbo). Credit should be given where it is due: at certain points Kutcher does bear a striking similarity to Jobs, but up close he doesn't; in terms of his performance I think he did as good as he could, but he could not convince us that he was a visionary. What motivated him, drove him will remain unknown, and Kutcher is part of that problem. In fact, with the exception of Gad's Wozniak, no one was anything other than a figure that appeared but had no real life to them. Gad should be congratulated for making Woz a genuinely nice guy who doesn't understand why people would NOT want to buy motherboards rather than a computer all put together. About the only truly genuine moment in Jobs is when Woz bids farewell to Steve, making the sadness of it all moving. However, apart from Gad no one in Jobs is worth the time. The third and final problem is in Stern's directing. We start with the revealing of the iPod, but we don't even have the courtesy of ending with the iPod, ending instead five years prior to the start. It is emblematic of the chaotic, almost rushed manner to Jobs. He couldn't stop John Debney's score from being almost comical where cues us as to what is suppose to be IMPORTANT moments in his life. I will might rent this when it comes out, otherwise I am not particularly interested in this.